"Sugar Pine" redirects here. For the community in Madera County, California, see Sugar Pine, California. Pinus lambertiana (commonly known as the sugar pine or sugar cone pine) is the tallest and most massive pine tree, and has the longest cones of any conifer. The species name lambertiana was given by the British botanist David Douglas, who named the tree in honour of the English botanist, Aylmer Bourke Lambert. It is native to the mountains of the Pacific coast of North America, from Oregon through California to Baja California. The sugar pine is the tallest and largest Pinus species, commonly growing to 40–60 meters (130–195 ft) tall, exceptionally to 82 m (269 ft) tall, with a trunk diameter of 1.5–2.5 m (4 ft 11 in–8 ft 2 in), exceptionally 3.5 m (11 ft 6 in). The tallest recorded specimen is 83.45 metres (273 ft 9 in) tall, is located in Yosemite National Park, and was discovered in 2015. The second tallest recorded was "Yosemite Giant", an 82.05 m (269 ft 2 in) tall specimen in Yosemite National Park, which died from a bark beetle attack in 2007. The tallest, known, living specimens today grow in southern Oregon and Yosemite National Park: one in Umpqua National Forest is 77.7 m (254 ft 11 in) tall and another in Siskiyou National Forest is 77.2 m (253 ft 3 in) tall. Yosemite National Park also has the third tallest, measured to 80.5 m (264 ft 1 in) tall as of June 2013; the Rim Fire affected this specimen, but it survived. The sugar pine occurs in the mountains of Oregon and California in the western United States, and Baja California in northwestern Mexico; specifically the Cascade Range, Sierra Nevada, Coast Ranges, and Sierra San Pedro Martir. Naturalist John Muir considered sugar pine to be the "king of the conifers". The common name comes from the sweet resin, which Native Americans used as a sweetener. John Muir found it preferable to maple sugar. 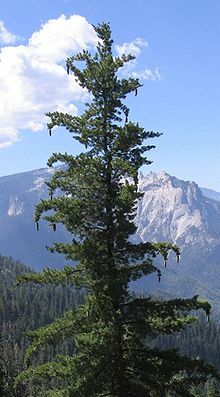 It is also known as the great sugar pine. The scientific name was assigned by David Douglas in honor of Aylmer Bourke Lambert. The Washo language has a word for sugar pine, simt'á:gɨm, and also a word for "sugar pine sugar", nanómba. ^ Jepson Flora Project (ed.). "Pinus lambertiana". Jepson eFlora. The Jepson Herbarium, University of California, Berkeley. ^ a b Kral, Robert (1993). "Pinus lambertiana". In Flora of North America Editorial Committee (ed.). Flora of North America North of Mexico (FNA). 2. New York and Oxford – via eFloras.org, Missouri Botanical Garden, St. Louis, MO & Harvard University Herbaria, Cambridge, MA. ^ Earle, Christopher J., ed. (2018). "Pinus lambertiana". The Gymnosperm Database. ^ Moore, Gerry; Kershner, Bruce; Craig Tufts; Daniel Mathews; Gil Nelson; Spellenberg, Richard; Thieret, John W.; Terry Purinton; Block, Andrew (2008). National Wildlife Federation Field Guide to Trees of North America. New York: Sterling. p. 79. ISBN 1-4027-3875-7. ^ "Sugar Pine Foundation". Sugarpinefoundation.org. Retrieved 18 June 2017. ^ "Sugar pine". Oregonencyclopedia.org. Retrieved 18 June 2017. ^ Saunders, Charles Francis (1976). Edible and Useful Wild Plants of the United States and Canada. Courier Dover Publications. p. 219. ISBN 0-486-23310-3. ^ a b Woiche, Istet (1992). Merriam, Clinton Hart (ed.). Annikadel: The History of the Universe as Told by the Achumawi Indians of California. Tucson: University of Arizona Press. ISBN 978-0-8165-1283-6. OCLC 631716557. Muir, J. (1911). My First Summer in the Sierra. Kinloch Jr., Bohun B.; Scheuner, William H. (1990). "Pinus lambertiana". In Burns, Russell M.; Honkala, Barbara H. (eds.). Conifers. Silvics of North America. Washington, D.C.: United States Forest Service (USFS), United States Department of Agriculture (USDA). 1 – via Southern Research Station (www.srs.fs.fed.us). Habeck, R. J. (1992). "Pinus lambertiana". Fire Effects Information System (FEIS). US Department of Agriculture (USDA), Forest Service (USFS), Rocky Mountain Research Station, Fire Sciences Laboratory – via https://www.feis-crs.org/feis/. Wikimedia Commons has media related to Pinus lambertiana. Conifer Specialist Group (1998). "Pinus lambertiana". IUCN Red List of Threatened Species. Version 2006. International Union for Conservation of Nature. Retrieved 5 May 2006.